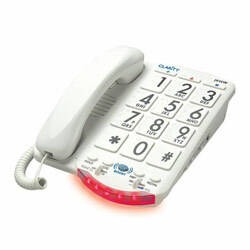 Facilitates telephone use for people with hearing impairments. Uses Clarity Power technology to make words not only louder, but also clearer and easier to understand. Large high-contrast buttons marked in Braille. Up to 37 decibels of amplification. Electronic voice repeats each number as it is dialed. Adjustable incoming volume control. Adjustable incoming tone control (600-2400Hz). Visual ring indicator. Extra loud (95-plus dB) ringer. Suitable for those with moderate hearing loss, the blind and those with low vision.